For Hartford (Conn.) Public Library (HPL), block parties and community theater are more than just forms of entertainment. They are potential ways to solve the issue of public safety and build a stronger relationship between residents and the police department. HPL’s community engagement director and project leader Richard Frieder says it’s inherent in the mission of public libraries to understand the needs of the community and help residents make their city a better place. “Libraries have an enormous asset, which is trust. People trust libraries, and public libraries in particular. 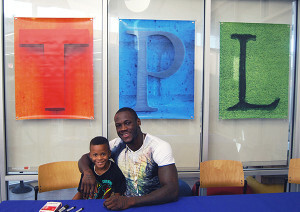 And that means that they feel comfortable coming to the library and sharing their ideas and concerns and working together with us to help solve problems,” Frieder says. Hartford resident Olusanya Bey talks with Sgt. 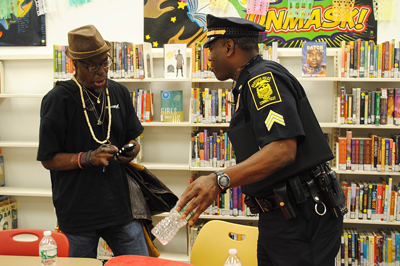 Steve Austin of the Hartford Police Department before the Hartford Public Library’s community dialogue on public safety and community violence in June. 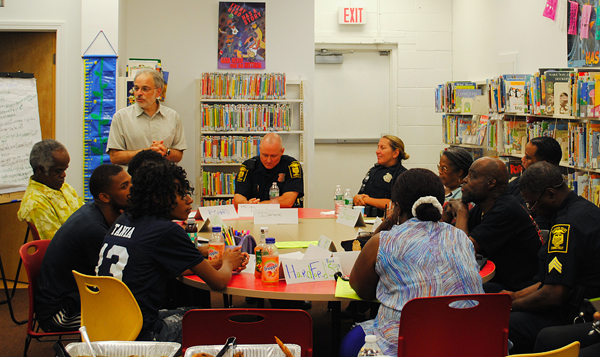 Through eight community conversations in Hartford’s North End neighborhood, HPL found that residents’ main concerns were public safety, community violence, and their relationship with the police. Frieder then led a three-session community dialogue on public safety with police and community members ranging in age from 18 to 87. During the three sessions, the groups got to know each other; talked about what makes a good neighborhood and what they liked about theirs, what they would like to change, how safe community members feel, and what they believed the residents’ and police officers’ roles were in making the community safe; and figured out how to take action and solve the problems. “The residents and the police basically agreed that mainstream media actually exacerbates the problems in the community,” Frieder says, referring to TV news and newspapers. “So we’re working on getting some mainstream media people to sit down together with the community members and some police officers to talk about how that might be changed, how to get the media to understand the community a little better,” Frieder says. Some of the ideas generated include having the police and the community members participate in more activities and learning experiences together, such as block parties and community theater, where they address these issues. Frieder said one moment that stuck out to him was at the end of the three sessions, when they asked the participants if there were any surprises in being part of community dialogue. 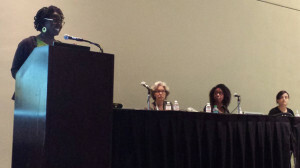 As a part of the LTC initiative, the 10 participating libraries have gotten together on three occasions, most recently at the ALA Annual Conference and Exhibition in San Francisco in June. At ALA Annual, Harwood Institute coaches led multiple sessions covering how leaders can engage their communities and create change using specific tools, such as aspirations, intentionality tests, and a “Turn Outward” quiz. Even though the 18-month project officially ends in October 2015, HPL’s staff hopes to sustain the values and goals they developed.